Made with brown sugar and real pineapple (think, roasted pineapple - yum! 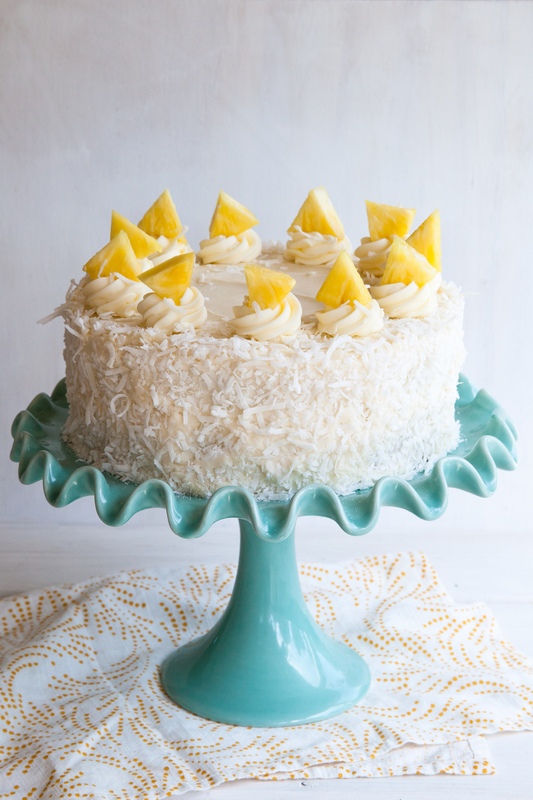 ), and just enough rum to spice things up a bit, two super-moist layers of cake are sandwiched and then smothered with the most delectable coconut cream cheese frosting and a blanket of snowy coconut.. And even despite my disdain for the texture of shredded coconut, I am in love with this cake. That there says a lot. We all know the five senses - taste, touch, sight, smell, and hearing, but have you ever thought about how they apply to food? With taste being the most obvious, the others do play an important roll in how we eat and taste different dishes. Without getting too technical on you all, let's briefly discuss - shall we? Smell might be almost as equally important as taste. And many will argue that the two have everything to do with each other. Ever wonder why you can't hardly taste your food when you have a cold? A stuffed-up nose =no smell= no flavour. Following closely behind taste and smell is sight- or what the food looks like. Does it make your mouth water just by looking at a photo? Or does it look bland and boring? After all, we "eat' with our eyes first - especially in the food blog world where a photo of a dish speaks a thousand words and is what probably gets one to try a certain recipe in the first place. It took me a moment to think about how hearing really applies - besides the ding of the microwave telling you that your food is hot. However, there is a lot more listening involved, whether we are conscious of it or not. The sound of bubbling soup signals us to lower the heat to a simmer, the sizzling sound of fajitas brought right to the table means I'll have to wash the grilled pepper and chicken small out of my hair, and the crack of a spoon diving into the crunchy top layer of a creme brûlée will make me smile every time. Then there is touch - or how the food feels: temperature and texture. It's the difference between me loving a hot bowl of tomato soup but not being able to stomach a cold gazpacho. For me, one of the worst offenders has got to be shredded coconut. I love the flavor of coconut, but the texture is like an assault on my mouth. It is impossible to really chew and my tongue always seems to be able to search it out of any baked good it tries to hide in. With that being said, this Pina Colada Cake must be exceptional for me to down a slice. And I did. A few, in fact. Head on over to Brit + Co. for the recipe!